Macedonia Gets New Name, Ending 27-Year Dispute With Greece Both countries claim the name "Macedonia" as their own. After decades of thorny negotiations, the former Yugoslav republic will become the Republic of North Macedonia. Macedonia will now be named Republic of North Macedonia after its prime minister reached an agreement with his Greek counterpart. A monument to Alexander the Great is seen in the center of Skopje on Sunday. Ever since the Republic of Macedonia declared its independence in 1991, Greece has been fighting the country over its name. 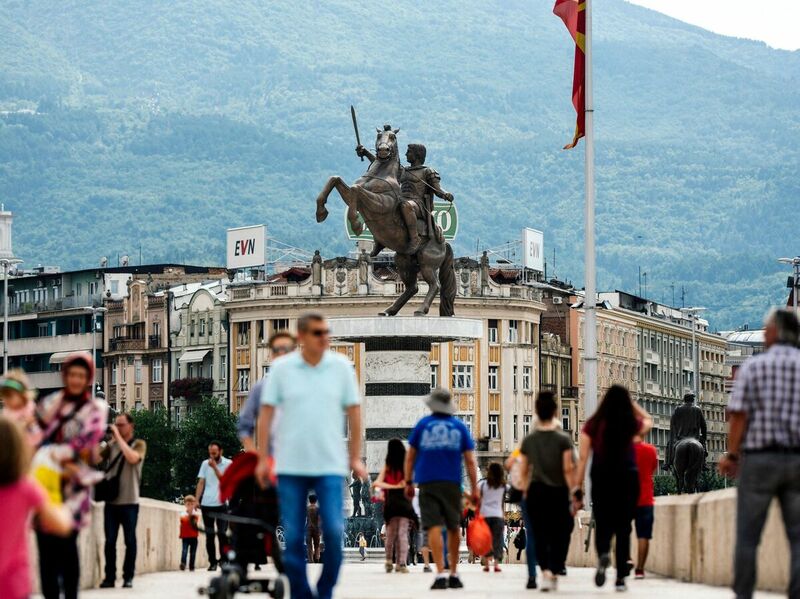 Today the 27-year impasse ended as two nations finally came to a resolution: The former Yugoslav republic is getting a new name, the Republic of North Macedonia. "There is no way back," Macedonian Prime Minister Zoran Zaev said in a press conference, Reuters reports, after he spoke with his Greek counterpart Alexis Tsipras. "Our bid in the compromise is a defined and precise name, the name that is honorable and geographically precise — Republic of Northern Macedonia." When Yugoslavia disintegrated, one of its pieces declared itself the Republic of Macedonia. But its southern neighbor, Greece, has regions that use the same name, and both countries argued that they had the rightful claim to it. "We have a deal. I'm happy because we have a good deal which covers all the preconditions set by the Greek side," Tsipras said, according to Radio Free Europe/Radio Liberty. The issue has been heated, and one with very real repercussions for Macedonia: It hasn't been able to join the European Union or NATO because Greece opposed its name. It was admitted to the United Nations as the Former Yugoslav Republic of Macedonia, because of Greece's objection. The statements from diplomats trumpeting today's deal reflect the linguistic awkwardness of the issue. NATO Secretary-General Jens Stoltenberg's statement refers to "the agreement between Athens and Skopje" rather than naming the countries. "This historic agreement is testament to many years of patient diplomacy, and to the willingness of these two leaders to solve a dispute which has affected the region for too long," Stoltenberg said. "I now call on both countries to finalise the agreement reached by the two leaders. This will set Skopje on its path to NATO membership. And it will help to consolidate peace and stability across the wider Western Balkans." As a result, previous Greek governments have claimed that the Republic of Macedonia— tiny, impoverished and with virtually no military might — also has territorial designs on its province. Matthew Nimetz, a retired U.S. diplomat, has been the U.N. mediator on the issue since 1994. He told the BBC last year that he probably has spent more time thinking about the word "Macedonia" than anyone, including in the country itself. In a statement, Nimetz congratulated the two prime ministers on reaching an agreement: "I have no doubt this agreement will lead to a period of enhanced relations between the two neighbouring countries and especially between their people."